अगर आप भी PNB में account open करवना चाहते है तो आपको PNB account opening के लिए valid KYC documents देना पड़ेगा . 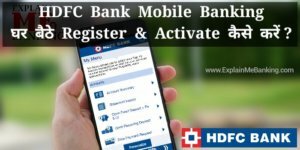 बिना PNB KYC documents के आपका अकाउंट नहीं खोला जायेगा. यह जरुरी है कि आप जब भी अपना अकाउंट खुलवाने के लिए जाएँ तो अपने साथ valid KYC documents जरुर लेकर जाएँ. अपने साथ ये documents लेकर जाने के लिए आपको यह जानना जरुरी है कि आखिर ये valid KYC documents कौन-कौन से होते है . इसलिए इस post में हम आपको PNB account opening valid KYC documents का पूरा लिस्ट देने जा रहे है. PNB ATM Green PIN Generate And Activate Kaise Kare ? 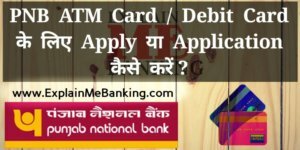 Punjab National Bank ATM Card Block / Hotlist Karne Ke 3 Aasaan Tarike ? PNB Account Opening Valid KYC Documents Kitne Type Ke Hote Hai ? ये दोनों तरह के डॉक्यूमेंट का 1-1 proof जरुर जमा करना पड़ेगा . तो चलिए अब हम इन दोनों तरह के documents का लिस्ट हम जान लेते है . Proof Of Identity में उस तरह के documents होते है जिससे आपके बारे में बैंक को पता चल सके . इससे आपके बारे में बैंक को verify करने में ( आपकी पहचान करने में ) आसानी होती है . PNB account opening के लिए Identity Proof का लिस्ट मैं नीचे दे रहा हूँ . Bar Council/ Medical Association/ Institute of Chartered Accountants of India/ Institute of Cost Accountants of India / Institute of Company Secretaries of India, Card with photograph. Student Identity Card with photo issued by reputed colleges with validity during the course period. Defense Dependent’s Card with photograph. 8. Letter from a recognized public authority or public servant verifying the identity and residence of the customer to the satisfaction of bank. 10. Credit card with photo together with statement of such card, not more than three months old. 12. Arms License issued by State / Central Government of India. 13. Freedom fighter’s pass issued by Ministry of Home Affairs, Government of India with photograph of applicant. 14. Employee State Insurance Card (ESIC) with photograph supported by latest month’s pay slip. ऊपर आपनें Identity Proof KYC Documents का लिस्ट देखा इनमें से कोई भी एक document लेकर PNB account opening के लिए जा सकते है. 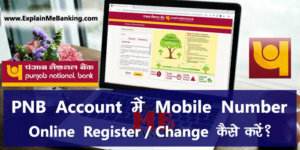 PNB SMS Banking Me Mobile Number Register And Enquiry Kaise Kare ? ATM Card Expired Ho Gaya Hia Ya Expire Hone Wakla Hai. New ATM Card Kaise Milega ? Proof Of Address में ऐसे documents आते है जिससे बैंक को आपके address के बारे में पता चल सके . इससे बैंक को आपके address के बारे में verify (प्रमाणित)और पता लगाने में आसानी होती है . 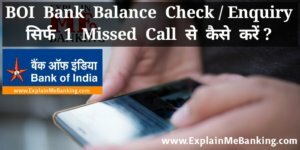 इससे जब भी आपके साथ बैंक को communication करना रहेगा तो उसी address में PNB आपसे related services को भेजेगा . PNB account opening के लिए Address Proof का लिस्ट मैं नीचे दे रहा हूँ . 10. Letter from any recognized public authority having proper and verifiable record of issuance of such certificates. 12. Pension Payment Orders issued to retired employees by Government Departments/Public Sector Undertakings, if they contain current address. 13. Copies of Registered Lease & License agreement/Sale Deed/Lease Agreement. 14. Certificate and also proof of residence, incorporating local address as well as permanent address, issued by the Hostel Warden of the University/Institute, where the student resides, duly countersigned by the Registrar/Principal/Dean of Student Welfare. Such accounts shall however, be required to be closed on completion of education/leaving the University/Institute provided the constituent does not give any other acceptable proof of residence to the Bank. 15. For students residing with relatives, address proof of relatives, along with their identity proof, can also be accepted provided declaration is given by the relative that the student is related to him/her and is staying with him/her. 16. In respect of officials of Central/State Governments and Public Sector undertakings, who are low risk customers for Bank, Branch Heads may verify the photo/identity and confirm residential address of such officials from independently verifiable sources, to their satisfaction, and permit opening of accounts. This facility is extended only to the Gazetted officers of Central/State Government and Senior Management and above functionaries of Public Sector Undertakings. 17. Latest telephone bills from any telephone service providers and mobile service providers not more than 2 month old, postpaid. 18. Consumer gas connection card/book/Pipe gas bill. 19. Certificate from ward/equivalent rank officer, maintaining election roll certifying address of the applicant. 20. Post Office Savings Pass Book. 21. Domicile Certificate with communication address and photograph. 22. Certificate by Village Extension Officer (VEO) / Village Head or equal or higher rank officer. Branch to confirm the authenticity of the certificate and that it has been issued by the person who is holding the said office. 23. Court divorce order – Marriage annulment order issued by Court. 24. Rent Agreement indicating the address of the customer duly registered with State Government or similar registration authority may also be accepted as a proof of address. ऊपर आपनें Address Proof KYC Documents का लिस्ट देखा इनमें से कोई भी एक document लेकर PNB account opening के लिए जा सकते है. जिन भी documents के आगे Hash (#) का निसान है वो 3 महीनों से ज्यादा पुराने नहीं होने चाहिए . अभी के समय में सभी को अपना Aadhaar Card जरुर से जमा करना रहता है. यानि की आधार कार्ड एक mandatory proof है जो आपको देना ही पड़ेगा . 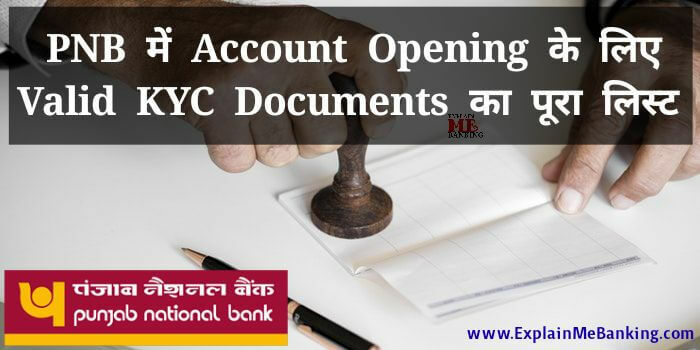 तो अब आपको PNB account opening valid KYC documents के पूरे लिस्ट का पता चल गया है . इनमें से आपके पास जो भी है और आपको जो भी देने लायक डॉक्यूमेंट लगता है उनको लेकर जाएँ और अपना account PNB में खुलवा लीजिये . मुझे उम्मीद है कि आपको इस post से PNB Account Opening में मदद जरुर मिलेगी . क्या आपने अभी तक हमारे Facebook Page “Explain Me Banking” ko LIKE नहीं किया है. अभी LIKE कर लें और हमारे सभी Post की जानकारी FREE में लेते रहे.